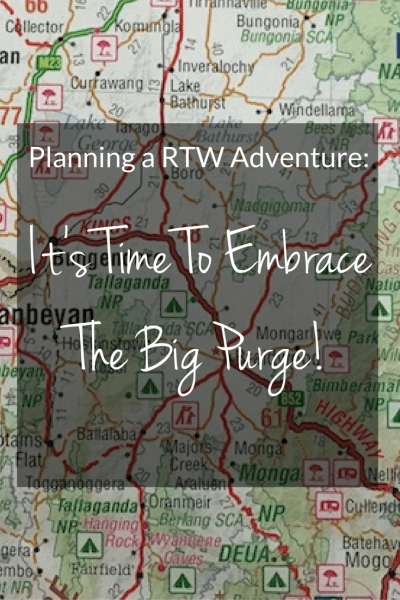 RTW Planning: It’s Time To Embrace The Big Purge! 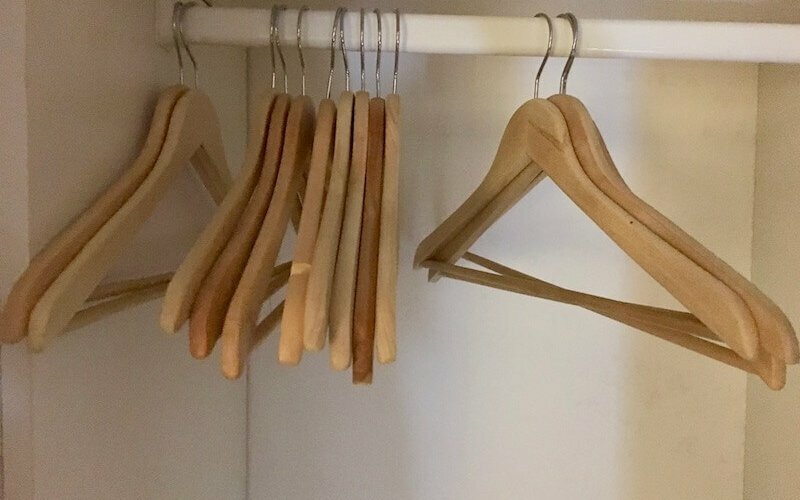 It’s Time To Embrace The Big Purge! When you’re faced with indefinite travels, it’s shocking how brutal you must become with your belongings. For whatever we decided to keep, we need to pay for a storage space for at least the next two-three years. In Australia, storage doesn’t come cheap. We don’t know where we will end up if we ever DO decide to settle down again. That is, we don’t know which country that may even be! We know that at this stage of our lives, we don’t want – or need – more stuff. Our mind set is more with streamlining what we have, to just the basic necessities. Because when it comes down to it, it’s just stuff. We don’t value the quality of our lives on our belongings. In preparation of our long-term travel plan, we’re purging our belongings. It’s not an easy process especially when you’re lying in bed at 2am, mentally going through your to-do list. The thoughts run a mile a minute and it’s easy to become overwhelmed. I’ll be honest and say that I’ve woken in a panic attack more than once at the overwhelming amount to do, especially since I would call myself a proficient and experienced packer. But this is different. This is not moving. This is purging of all the things we have been moved from one place to another – for years. It’s easy to throw everything in a box, leveraging movers only to unpack it at the other end. When faced with monthly storage costs that would make your hair turn grey from sticker shock, you can’t think that way. The first task we tackled was the make sure that Natalie had everything she needed before heading off to University. The fact that our departure and her entering University life happening at the same time was not a coincidence. We planned it that way. It has always been the plan to travel full time once she finished high school and began her adult life in the big wide world (or started University, whichever was decided). Making sure she had enough to set herself up was the priority. Luckily, a private dorm room was an available option at her chosen university. That meant she didn’t have to worry about invading someone else’s space. Adding to that, the dorm is self-catered, which is great as we can easily set her up with whatever she needs (or wants!) – without going broke to do it! The next task was to determine what we would need for our camping/Airbnb/Housesitting life. For the initial ten months, we will be road tripping it around Australia, so we needed basics ourselves. While most of our camping equipment works fine, we needed to streamline what we had. Given we had a whole kitchen of gadgets to choose from, we were able to replace the cheap camping utensils with quality ones. We also wanted to be sure that we were comfortable in our travels. Not just ‘getting by’. We had to save our sanity a little too! And yet, with limited space in our Ford Kuga, adding in a Thule Cargo Pod to the car, we needed to make sure we were using the space effectively and not simply filling it with ‘stuff’. It’s a different mind-set to live out of a car for ten months, that’s for sure. On to the final purging process. I must admit; I had been looking forward to doing this for a long time. There have been so many ‘projects’ that I’ve started and stopped over the years, that even with an overseas move, I still lugged things around. For example, one of my past hobbies was scrapbooking. I was so into the hobby that I was both a Stampin’ Up consultant and a Creative Memories consultant (scrapbook suppliers) just so I could get discounts on albums and cardstock to make MORE scrapbooks. I would go to scrapbook conventions every year. My enthusiasm has led to about 20 voluminous scrapbook albums that I need to store somehow. These document everything from Natalie’s childhood to my (now deceased) Mother’s life. Rich used to haul these albums from the bookshelves to under the stairs whenever we had tornado warnings in Texas. He knows how much these albums mean to me. I spent three days culling through photographs. Three days. Doing nothing else but sorting through photos. I guess (in that regard) you could call me a hoarder. Going through the photos, I managed to get the photos down to three small boxes. Everything I want to keep was digitized (can you wear out a phone camera?) and the rest, tossed or recycled. I’ve been lugging around boxes and boxes of photos for years…But, somehow I’ve also unknowingly managed to hang onto boxes – yes boxes – of negatives. Ugh! I found this treasure in the photos. 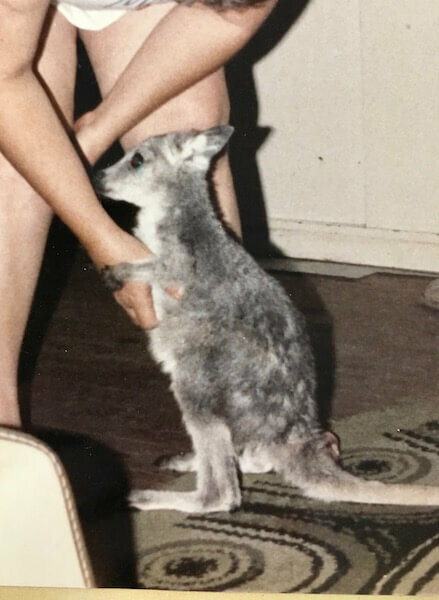 This is "Winnie", the wallaby we rescued. We called her Winnie because she used to Poo(h) everywhere. From there, the purging process gets easier. Somehow with the emotional connection with the photos, once they were digitized and sorted, it allowed me to let go and move on. I’ve run the same culling process with books. Natalie took inventory of the books we either shipped (‘but it’s a great book!’) from America or books we’ve since purchased here. We will be selling what we can and donating the rest to our local library. Our clothes have been sorted and now it’s down to what will be needed for our 10-month trip and what will be stored. I daresay we will have one small box of clothes to store when it’s all said and done. It’s an enlightening experience purging your belongings. 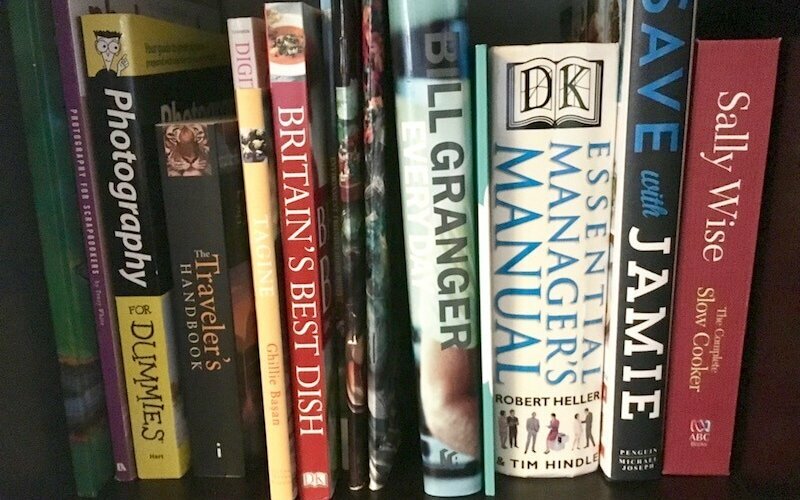 As I look through the cupboards in the kitchen, despite the joy cooking and baking has given me over the years, I look and see only stuff to purge. Like the Pampered Chef stoneware I shipped from America. Bakeware that meant so much to me that I had heart palpitations when the packers were wrapping them up and tossing into boxes when we moved from Texas to Sydney. I haven’t used them in nearly four years. It’s time they find their way to a charity shop for someone else to gasp at, their own ‘treasured find’ at the Op-Shop! I can find a cheaper alternative just as easily. Admittedly, there are a few sentimental knickknacks that I’ve come across makes my heart ache to even think about tossing. Yet, I seem to grow less attached as each day goes by. Some, of course, will make it into one of the few boxes. Things that are just too precious (to me) to dispose of and will be a joy to unpack … down the road. 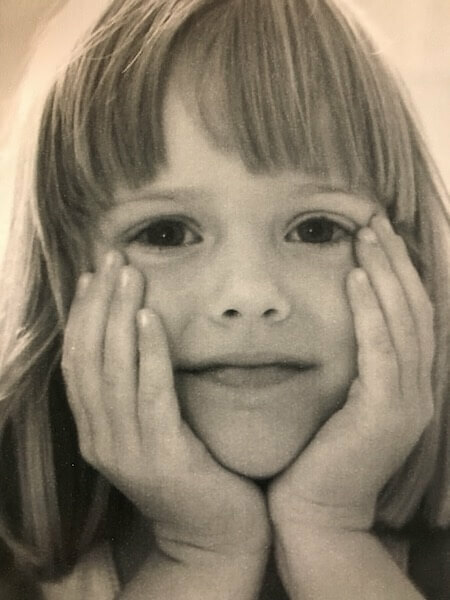 More treasured things... photos of Nat when she was younger. The time it takes to purge your belongings should never be underestimated. Thankfully I’ve been sorting through all this stuff mentally for months, so when the time came, I could do it efficiently. The key is to get your head around the process first, reminding yourself of the bigger goal. Otherwise you will end up holding on to those books and photos, along with those knickknacks that are just collecting dust. The purging process is an emotional one, no doubt about it. Going through our photos, looking at old memories, remembering old friends and fun times with family members who are no longer with us…Those are moments that you should take your time with. Those are the ‘things’ to hold to. When I talked to friends about this process, some have said it’s good to have a friend help you. But it must to be someone you trust implicitly. Someone who will ask you the ‘will you miss it?’ questions. The ‘tell me the story of this item’ when you hesitate to purge it. Someone that will remind you of the bigger picture when the emotions take hold. For me, having the goal to travel for as long as I can remember was incentive enough. I have had my moments and yes, there are some things too precious to part with. 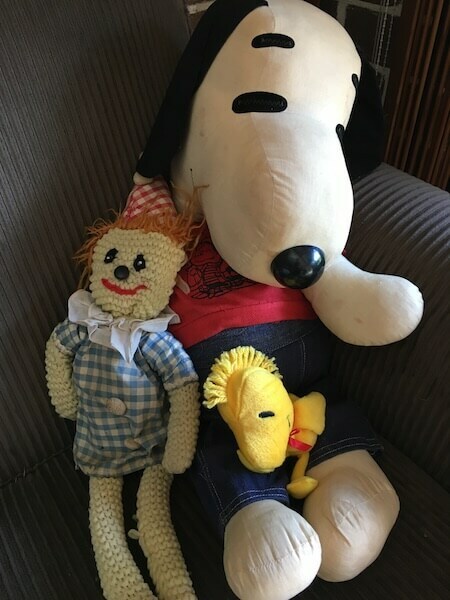 Like my stuffed Snoopy, for example, that my parents bought me when I was a young child. Or, the clown (Clowny!) doll my grandmother made for me, right before she had a debilitating stroke two weeks before I was born. Or, the Christmas ornaments we’ve been collecting every year from our travels. Then, of course, there are those scrapbooks. Yes, those are the things that are worth the storage rental fee. Those are the things that we will store. Those are the things we can’t get rid of because when we do eventually settle, those are the things we will be glad we still have. They are cherished reminders of the wonderful people in our lives that helped give us the courage to embark on this life-changing grand adventure.